Goulash at its best. Macaroni and hamburger in a sweet tomato sauce. Perfect on a busy weeknight. Serve it with buttered bread and a side salad. 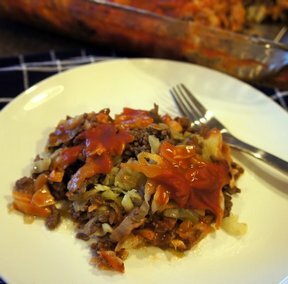 Cook ground beef and onions until beef is no longer pink; drain. Add tomatoes, celery, green pepper and seasonings. Bring to a boil; cover and simmer for 25 minutes. Add cooked macaroni and simmer another 10 minutes. 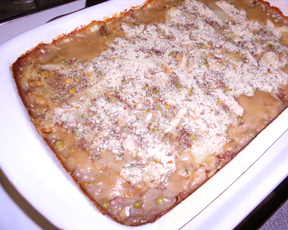 Put in casserole dish and top with cheese. 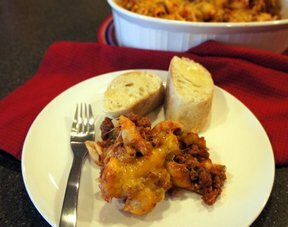 "My 20 month old loved this with shell macaroni! I made it in advance and then baked it, covered, for 30 minutes when we were ready to eat. 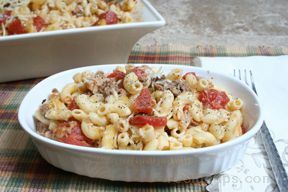 I think the crushed tomatoes made it a little sweeter than the diced tomatoes I usually use."